I have been using PTCL Internet through land line for a while, then shifted to DSL Broadband Since it launched. No doubt, it has very good signal strength, actually PTCL landline signals are very strong and stable. 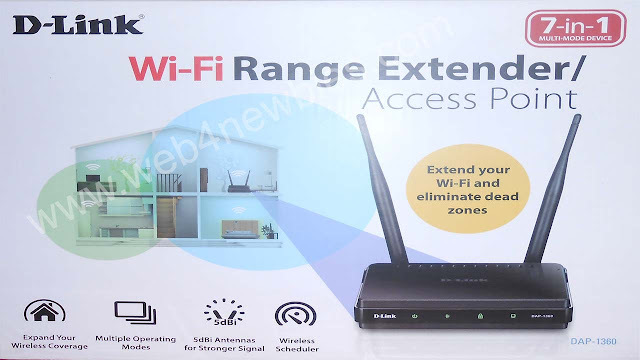 if you have been using PTCL DSL broadband modem then you will notice that its Wifi signal will cover your whole home, even you will receive good signals in first floor and outside your home. 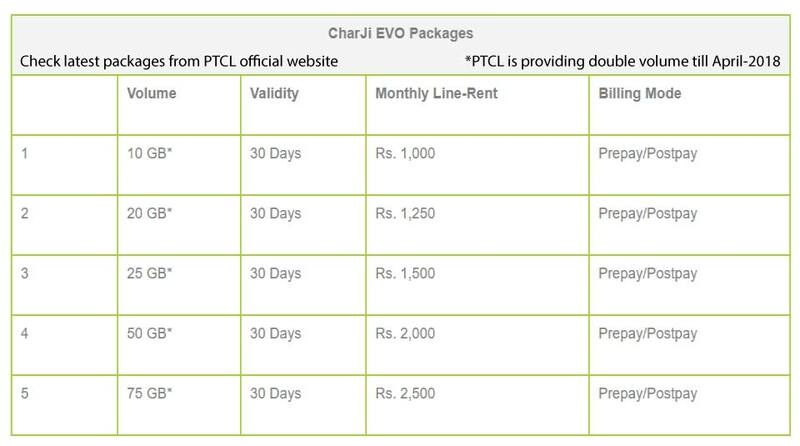 But if you use PTCL Wireless devices like EVO Wingle, Charji Evo Wingle etc then you will see that signals are not stable and strong. 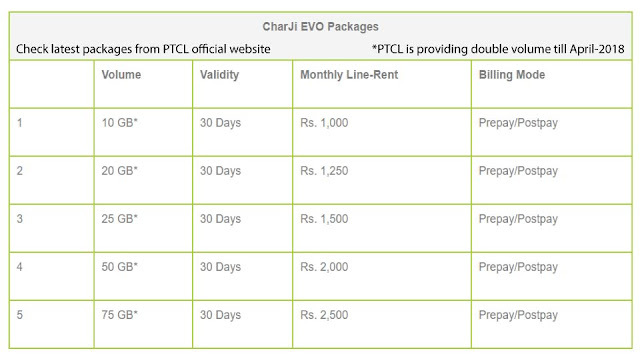 2MB Unlimited Broadband Landline connection costs you almost 2,550/- per month including taxes and line rent, you can check latest CharJi EVO Wingle broadband packages from PTCL website, here in below image packages are given on dated 02-03-2018 the only problem with fixed line broadband Internet is its cost is more than Evo Wingle devices and speed is low, moreover when your phone line is disconnected, you have to wait for days to get it fixed. Now the problem every new customer faces when he wants to use USB WIFI Evo Wingle devices is How to improve its signals strength, which is discussed below. 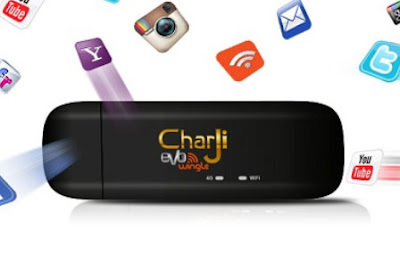 CharJi EVO Wingle is good alternative of landline connection, with good speed and very low disconnection, You can buy CharJi device from any PTCL SmartShop in only Rs.2,500/- up till 18-03-2018, when this article updated. When I bought 4G evo wingle device on 04-Jan-2018. I was surprised to See that its signal was not going even in another room. 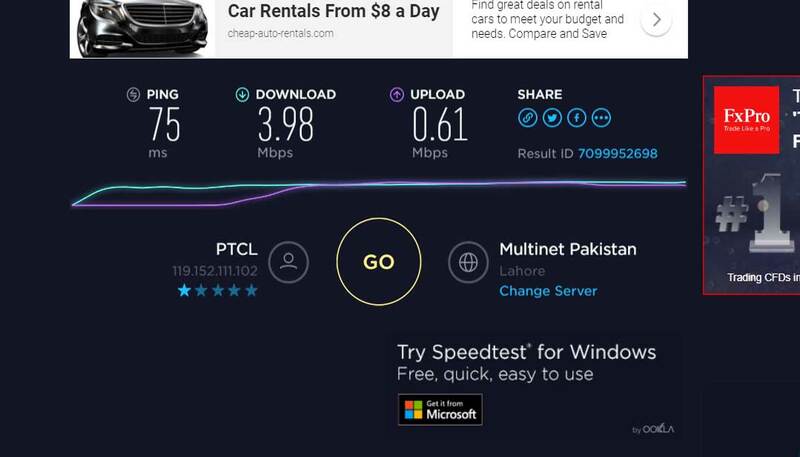 PTCL claims that is its signal range is about 10 to 15 meters but it did not cover 10 feet if there are walls in between. So this device is only useful if you use it for single computer or laptop. To extend the Charji EVO signal range and to use it in your whole home you have to purchase an additional third party device, which i personally using D-Link Wifi Range Extender. This device you can purchase from Hafeez Center Lahore from Rs.3,000/- you can get it configured from the shop, this comes along with CD and networking cable, directly connect it with you PC and configure it with any wifi device including PTC Charji 4G Evo wingle. You can use this device not only with Charji Evo Wingle but also for boosting any Wifi device signals but firstly you have to configure it. If you like this post don't forget to like and share our Facebook page. You can buy D-Link DAP-1360 from Hafeez Center if you live in Lahore, Pakistan alternatively if you want to buy online you can visit Amazon through this link for international buying. Turn on your Charji Evo Wingle device and DAP-1360 wifi range extender, Type in your browser search bar http://dlinkap/cgi-bin/webproc and press enter, writer username as admin and leave password blank and hit login. A button will appear with "Launch Wireless Setup Wizard" press the button and follow on screen setup to complete the setting. When prompt for Wireless mode select "Repeater" from drop down list. Web4newbies.com is related to basic level tutorials and tips for newbies who want to start a blog as a hobby or want to earn few bucks online, here you find info about Blogger, WordPress, Youtube, Freelancing, Forex, Digital Coins, Internet Payment Processors, CPA and Affiliate Marketing.